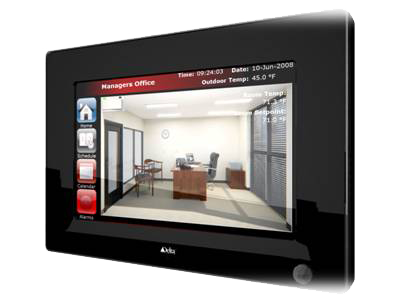 The EnteliTOUCH (eTCH-7E) is a 7-inch diagonal, high resolution, wide-screen format, color LCD, used for interfacing with the Delta Controls Building Automation System. It uses BACnet® to communicate with controllers on a local area network, and across the Internet using real-time graphics. Expansion modules can add MS/TP communication, or allow the enteliTOUCH to act as a wireless coordinator to enteliMESH products. User created graphics allow the enteliTOUCH to be completely customized for a given application. The enteliTOUCH can be wall or panel mounted in mechanical rooms which allows for monitoring and setting schedules for air handlers, boilers, chillers and other mechanical equipment. It is also designed to be mounted in public spaces. The enteliTOUCH can be used as a small building interface making it easy for occupants to change occupancy schedules, adjust temperature setpoints and view floor layouts.